This Buck Nighthawk 650 is the longer version of the two Nighthawks. 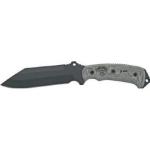 This was designed between both Buck and Tops knife companies. 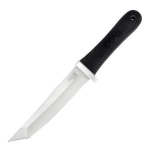 This knife came razor sharp with an excellent black coating to eliminate glare. The handle has a great rubbery feel that prevents my hand from slipping, even when wet. The blade is longer than 6 inches (6.5"?) and it is a very thick blade. It even has an opening in the blade so you can operate and oxygen tank valve. This is a very good knife that seems to be under-rated by most websites. If you held it in your hand, you would see the value it offers. Holds an edge very well, too! Bought this as a outdoor knife, and I have not been disappointed. The ergonomics of this knife are among the best I've held. The rubber embedded in the plastic handle has a texture to it that prevent the handle from becoming slick when wet. There is also a thumb platform built into the handle, so you can get leverage when needed. The blade is thick, but narrow. Reminds me of a fillet or steak knife, but much thicker. 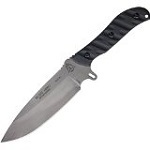 The thickness makes the knife feel solid, but the narrow blade makes it handy and lightweight. The blade is 420HC, with Buck's heat treat. There are fancier steels out there, but Buck's blades have stood the test of time. I've been able to get the blade functionally sharp, but not razor sharp. May be me, may be blade geometry.